Successfully Added 4K TV Box - Android 6.0, Google Play, KODI 16.1, 4K Resolution, 2GB RAM, Octa-Core CPU, Mali-T820 GPU to your Shopping Cart. Turn your living room into your own little private cinema with this Android 6.0 TV box. Enjoy the latest movies, your favorite series, online games, and a whole lot more from the comfort of your sofa – with this Octa-Core TV box your possibilities will be endless. Supporting 4K resolution you will be able to enjoy all your favorite media like never before. Stunning details, vivid colors, and a fast and smooth user experience, this Android TV box has it all. 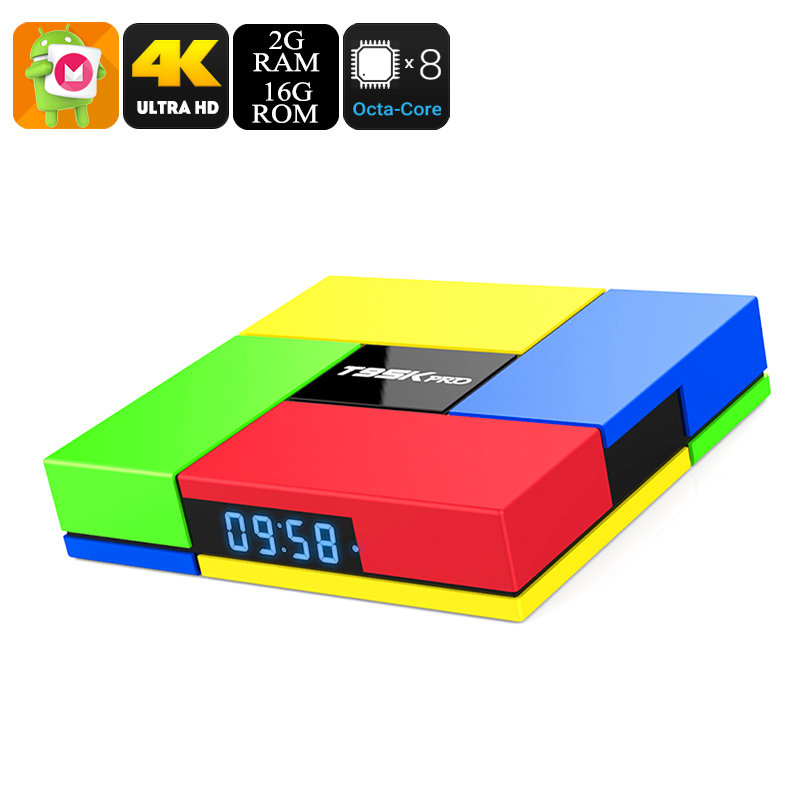 Even from the outside, this TV box features an extraordinary and colorful Rubix cube design, making it truly a feast to the eye. Featuring the Amlogic S912 CPU, you can be assured that this little power horse brings along a speedy and lag-free experience. Built for speed, this Octa-Core CPU that has been clocked at 1.5GHz is capable of handling the most demanding of games and media alike without dropping a frame. By offering 2GB of RAM this smart home accessory furthermore offers you all that’s needed for excessive multitasking sessions. Browse the web or enjoy multiple mobile applications at once, nothing will be able to slow down this little beauty. Running on an Android 6.0 operating system, this 4K TV box comes packed with all the latest features the industry has to offer. Supporting 4K resolution this TV stick certainly is capable of providing you with a true cinematic experience within your own living room. Simply hook up the device to your regular TV and you will be able to enjoy hour’s worth of online fun and entertainment. With both Google Play and Kodi TV installed you will have free access to millions of the latest free to download movies, games, applications, and a whole lot more – ensuring that from now on there won’t ever again be a single moment of boredom within your household. With its 16GB of internal memory and the added possibility to insert 32GB storage externally, ensures that there will always be enough space for you to save your favorite media. Whether you simply like to browse the web, spend a cozy night at home with your wife and kids, or want to enjoy a fun packed movie / game night with your best friends – this 4K TV box has an answer to all your demands. No matter the type of media you like most, with its Mali-t820MP3 graphic’s unit and 4K support you can be assured that you’ll be experiencing a truly breathtaking visual experience. Offering unlimited fun and entertainment, this Android 6.0 TV box is the perfect smart home accessory for any modern household and office alike.